2018 is the year of Israel’s 70th Anniversary as a modern nation and a time to celebrate all God has done to revive a nation! The Jewish People celebrated Israel’s Independence Day on April 19th, according to their calendar, while the world marked the anniversary on May 14th, in keeping with the Gregorian calendar. Which ever date you celebrated Israel’s 70th Anniversary on it’s great to remember how the modern State of Israel was proclaimed seven decades ago. It was Israel’s first Prime Minister, David Ben Grunion’s that made the historic declaration in Tel Aviv after some 2,000 years of Diaspora. In Israel, the annual Independence Day is known as Yom Ha’atzmaut and it was a truly miraculous event all those years ago when “a nation was born in a day”. Though the land always retained a Jewish presence, it was not accessible to the Jews of the Diaspora, even though they were evicted by pogroms and had nowhere to go. In fact, many were prevented from returning right up to the end of the British mandate, as prior to 1948 even Holocaust survivors were turned away from its borders and put in internment camps in Cyprus. The story of the rebirth of Israel as a modern nation is a miracle of history. Never before had a nation been reborn after two millennia, never before had a language been rekindled after so many years or exile. You can watch some of this unfolding miracle in the video above, Revival of A Nation which tells the story in a simple but compelling way. These scriptures were supernaturally fulfilled in 1948 and God continues to gather His people back from the nations of the world. He sent His people into exile due to their idolatry, but He is the covenant keeping God and He swore He would bring them back. The video shows how the Israelites were once a great and independent nation, at one time led by King David and his son, Solomon who built a Temple to God. It records the Roman occupation and the destruction of the Temple which dispelled the Israelites from their nation and shares their burning desire to return to the land of the forefathers. You will hear about Theodor Herzl, the founder of Zionism and Ben Yehuda who rekindled the Hebrew language. The dreams of the Jewish people were always there – ‘Next year in Jerusalem’. The Balfour Declaration brought hope but this was overshadowed by the Nazi era and the most horrendous crimes against humanity. Finally, from the depths of despair, there came hope. In 1947 the UN voted on the building of two states, ones for Arabs and the other for Jews. The Arabs rejected the plan and declared war, leaving the new Jewish state to fight for its very survival. Despite the War of Independence in 1948, the Six-Day War of 1967, and Yom Kippur War of 1973 Israel survived and later signed peace treaties with Egypt and Jordan. 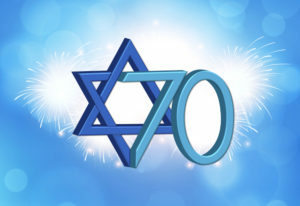 On Israel’s 70th Anniversary we at GOD TV acknowledge God’s Hand in the building of the State of Israel and applaud the Jewish people for the many, many achievements they have brought about to make the world a better place, including inventions to help mankind and at least 10 Nobel prizes. We are committed to blessing Israel not only because this is a Biblical command by God, but because of a deep love for a people that God refers to as “the apple of His eye”. We are also committed to discovering the Jewish roots of our faith and to stand against anti-Semitism in all its forms. We are committed to praying for the Peace of Jerusalem which means God’s peace (shalom) for all the people of the Middle East. Israel is the only democracy in the Middle East and we must support her as a nation. This is why GOD TV has a regional director in Israel, Ron Cantor and we carry so much programming focused on Israel. Just three series include Jewish Voice with Rabbi Jonathan Bernis; Out of Zion with Ron Cantor; and Roots and Reflections hosted by Barry and Batya Segal of the Joseph Storehouse. The main focus of our celebration of Israel’s 70th Anniversary has been our Bless Israel campaign in January where we raised funds to help underprivileged children in Israel in partnership with Scott Volk of Together for Israel, as well as supporting charities reaching out in Israel. We also took an ‘Arise Zion’ tour to Israel in March, taking our viewers and partners from across the nations to Israel to experience the wonder of the Holy Land for themselves. Led by our CEO, Ward Simpson along with Ron Cantor this was life-changing for all who participated. This article was written by Al Gibson, editor of GOD TV.com who has worked for GOD TV since 2002. He is a based in England, has some 30 years experience in journalism and is the author of three biographies, including Life After Belsen which tells how many of the survivors of the Holocaust waited a further five years after WW2 ended to be resettled in their ancient homeland.